Snow! 15 min to Eldora Ski Slopes! Relax in the comfort of rustic luxury on 2.5 acres of wooded seclusion fronting South Boulder Creek in the cool mountain air. Enjoy your day flyfishing for rainbows and browns in well-stocked South Boulder or just be serenaded by the sounds of the fast moving water while lounging on our expansive deck. Experience the beauty of Colorado; hiking the surrounding Indian Peaks wilderness or nearby Golden Gate State Park—walk out your door to acres of public land or drive 15 minutes to an extensive network of mountain biking and hiking trails through National Forest and Park lands. Eldora Ski Resort a 15 minute drive from door to lift! Top off your active adventure day with a workout with the fully equipped gym and then finish with a soothing hot tub, whirlpool tub or sauna or stretch out in front of two fireplaces and multiple flat screen TV's with Direct TV on your choice of king-sized bed or the oversized sofa. Active and Relaxing at 8000 feet of Cool MT Air: Fish for Trout from 1680 feet of S Boulder frontage on our 2.5 acres of gorgeous mountain property, Hike out the back to 100s of acres of public land, Pan for Gold right off out Deck, over an ounce found last year! Work out with our complete gym with Olympic bumper plates, rack, rings, kettle bells, and concept two rower. Relax in our whirlpool tub or sauna. Spend the mornings and evenings on our 2600 square feet of decking sipping coffee or having a drink over our fire pit while watching and listening to the sounds of the water rushing by. Eldora ski resort is a very easy 15 min away. A best kept secret with great runs, short lift lines and an awesome Nordic ski area with over 40 km of groomed cross-country and snowshoe trails! Nearby: You’ll love the fact that you’re 10 minutes from the mountain town of Nederland, where you can reconnect with civilization at multiple restaurants, coffee shops, and quaint shops. Only 10-20 minutes to Casinos, Alpine lakes and meadows, World Class Hiking trails, 100s of miles of biking, Wonderful Mountain Restaurants, Ghost mining towns, Skiing, Snow Boarding, Snow Shoeing. Our family of 6 including our German Wire Haired Pointer - love being active; working out, hiking, camping, mountain biking, fishing, 4 wd trips, skiing, snow boarding, snow shoeing, if its active we probably like to do it. We spent several years vacationing in the Colorado Mountains. Then a few years saying how cool would it be to have our own place, Then a couple of more finding 'It'. We wanted to be secluded not remote, have running water, be with in a hour and half of a major airport, not too far from city conveniences but not to close either. We wanted to have hiking, fishing, and relaxation all in the same spot. We wanted our place to be 'rustic luxury'. We love our home and we love the great reviews and e-mails we get from others who have shared our place. On the water, not close, not near, it is ON the South Boulder Creek. There is a 'Trout Ranch' about a mile up stream that stocks - all those beautiful trout come down to our place. 'Cabin' that is secluded with all the luxuries of a 5 star hotel. Direct TV, Blue Ray DVD, Surround Sound, Hot Tub, Sauna, Full gym on 2.5 acres of Blue Spruce and Aspen. Bandwidth restricted -- email and internet access only. No streaming video or online gaming. Your well behaved and house trained dog is welcome with pre-approval, signature of pet addendum and one time additional 100.00 cleaning fee. Sorry no cats, owner allergies. There is a caretaker who will respect privacy, but assist upon request. 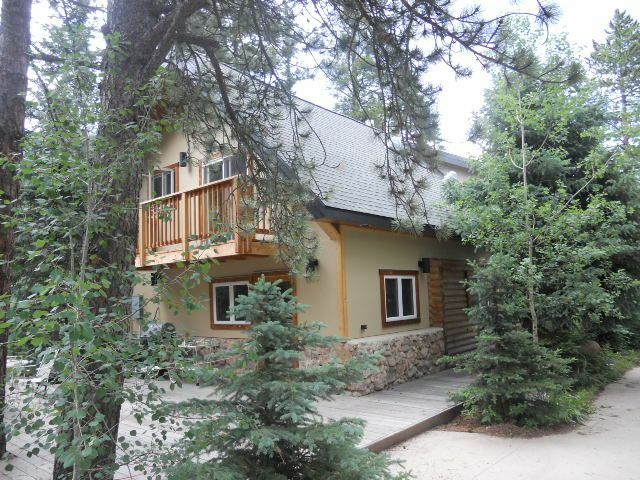 This cabin was the perfect location for a ski trip to eldora. The house was clean and beautifully decorated! Just as described. Great location with access to so many different places. We had awesome weather and the snow was beautiful. Even the dog had a blast. Thanks for the memories that were made! Great place to get away wonderful property excellent location!! We loved our stay, accomidations were superior, location the best! The stars at night unbelievable the creek amazing!! Our first trip to Colorado and we were blessed to find this lovely cabin right on a stream. The cabin was very clean, comfortable and equipped with all we needed: excellent kitchen, cozy living area, comfortable beds, and spacious decks. Access to the stream was perfect and we caught several 18 to 20 inch rainbow trout. Location was convenient to Golden, Black Hawk, and Nederland. We loved Ned with the shops and Carousel of Happiness. Also ate a good meal at Roy’s Last Shot. The mountains are beautiful. We hope to stay again. Great location and the house was terrific. Loved the area in general, great scenery, south Boulder creek provided some great trout fishing. We loved exploring the area. Just a couple of things need attention. First, the hot tub cover is very heavy to remove and should be replaced. Second, the gas grill could use some updating, however it was functional for us during our stay and cooked some great steaks. I consider both of these things quite minor and they did not impact the overall quality of our visit. Be prepared for the trains that run fairly close to the house. I have to say that we got used to the trains very quickly and kind of liked seeing them go by. Not an issue. The deck that goes down to the creek is really great. When we weren't fishing we usually spent time here. Really nice. Mountains, S Boulder Creek, Views, Fly Fishing, Trout Fishing, Hiking, Mt Biking, Snow Skiing, Snow Boarding, Road Biking, ATV, Hunting, festivals, Panning for Gold, Close to unique shops & cafes, only 35 minutes to Golden or Boulder, Golden Gate State Park, Indian Peaks, Caribou Open Spaces, Black Hawk Casinos, National Forest, Public Land, Wildlife. Property abuts historic Union Pacific rail line (active).